If, like me, you’re an avid fan of ITV’s Poirot, you’ll instantly recognise the iconic, white, Modernist country house that appears at regular intervals throughout the series. 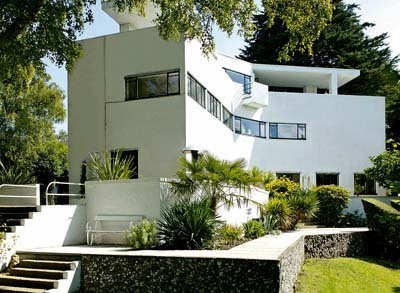 Originally inspired by the flat, white houses of ancient Greece, in real life, that house is High & Over at Amersham, Buckinghamshire, built in 1929 by the brilliant young architect Amyas Connell for his friend and contemporary Bernard Ashmole, the then Professor of Classical Archaeology at London University. Divided into two in the early 1960s, the house has been largely restored to its original 1930s style and layout by current owners Ian and Diana Halley, who bought the major part of the building some 14 years ago and the rest in 2008. It’s now on the market through Knight Frank (01494 675368) and Savills (01494 725636) at a guide price of £2.25 million. Christopher Hussey’s article in Country Life (September 19, 1931) recalls the intense hostility of local residents and planners to Connell’s proposed design, which had three main objectives: ‘to take utmost advantage of the scanty English sunshine; to enjoy to the full the magnificent view across and up the valley of the Misbourne; and to conform to the immediate contours’. The resulting Y-shaped building provided a sun trap to the west and south and a screen to north and east. But Hussey admits that ‘the white house, with its adjuncts, particularly the water tower on the skyline above it, does not fit in with the traditional view of the English land-scape’. It was only ‘with extreme reluctance’ that the plans were eventually passed by the local authority, which is derided by Hussey for preferring to afford ‘every facility for the erection of the most bogus types of “engagement ring” domiciles, which are neither true to standards of good architecture nor to the spirit of the age’. High & Over, on the other hand, embodied ‘architecture pure and unalloyed by sentiment, reminiscence or clap-trap’. Listed Grade II*, it now ranks among Britain’s most important 20th-century buildings. Set in 1.7 acres of formal gardens and mature woodland, the 5,000sq ft house has three ground-floor reception rooms linked by an impressive hexa-gonal atrium, plus a kitchen, a bedroom and a bathroom. There are six bedrooms and two bath/shower rooms on the second floor, and a further bedroom, a study and a sitting room on the second floor. A formal staircase leads from the hallway directly down to the circular, open-air heated swimming pool, the hole for which was dug by Prof Ashmole himself. Variations on circular forms were a favourite theme of 18th-century architects, and few plans of houses by leading designers such as Robert Adam and his successors are without a circle, and oval or an octagon somewhere in their layout. According to an article in Country Life (September 16, 1949), all three forms have been used to significant effect at Clare House, East Malling, Kent, which has a splendid oval drawing room, a circular library and an elongated, octagonal dining room grouped around a domed circular staircase hall. Built by an unknown architect for wealthy timber merchant and banker John Larking in 1793, the Grade I-listed Palladian house was bought by Berkeley Homes in a fairly dilapidated state in the early 1990s, and authentically restored by it under the watchful eye of English Heritage. As such, it has modern amenities such as underfloor heating, but double-glazing wasn’t allowed. Bought by Mark Lewis, its present owner, in 1996, and further improved since then, the striking, 8,000sq ft building has been a popular location for a number of TV and film productions, including the BBC’s recent lavish production of Vanity Fair. Approached via a gated entrance and private drive, Clare House stands in two acres of grounds originally landscaped by John Larking, and has six reception rooms, eight bedrooms and four bathrooms, plus substantial butlers’ quarters on the top floor and a large basement. Selling agents Firefly Properties (01892 838712) quote a guide of £4m. The Undercliff below Upper Cobb House at Lyme Regis, Dorset, was where actress Meryl Streep stood looking wistful and windswept in the 1981 film The French Lieutenant’s Woman, whose author, John Fowles, owned a historic Georgian house in the town. Since then, the film has entered the archives, but the classic Regency house has gone from strength to strength, being sold by Strutt & Parker in Exeter (01392 215631) no fewer than four times between 1998 and 2006. The price achieved was £530,000 in 1998; £1 million-plus in 2002; slightly more than that in 2003; and about £1.35 million in 2006. Now further improved and modernised, it is back on the market with Strutts at a guide price of £2.45m. Originally built in the 1820s, Upper Cobb House, listed Grade II, was known as Little Cliff until 1971, and before that, as High Cliff Lodge. The accomplished Edwardian architect Arnold Mitchell bought Little Cliff in 1915, and virtually transformed the house, creating a long drawing room, and extending the property in 1922 to include a large billiard room with a dramatic inset circular ceiling, now the library. The present owners, who are moving to be nearer to family living further east, have added a new kitchen and bathrooms, repositioned several rooms, and improved the Italianate gardens that have wonderful views of the Jurassic coast, the surrounding National Trust land, and out to sea. In all, Upper Cobb House has three main reception rooms, a conservatory, three/four bedrooms, two bathrooms, a double garage, a studio, a greenhouse and various stores.